UPDATE, Nov 2017: Manus Island Detention Centre will finally close, but that is not the end of the story for the men imprisoned there. I recommend reading Diary of disaster: the last days inside Manus Island detention centre, by Behrouz Boochani. I have been a crime novelist for over 15 years, and in that time I have had the honour of meeting and researching with international military personnel, FBI agents, homicide investigators, paramedics, undercover officers, survivors of crime, private investigators and more (and have myself earned my Certificate III in Private Investigation). Though I am a civilian, I have during this time often had access to non-civilian areas and have been made privy to highly sensitive information. It is a personal point of pride that I have, over many years, earned a considerable level of trust with many highly-trained professionals, and have been able to share through fiction the difficult stories of survivors and professionals with the tough job of protecting others in an imperfect and sometimes violent world. I have also been an unpaid advocate for child rights with UNICEF since 2007 and as of September 2013 my role has been expanded to UNICEF Australia National Ambassador for Child Survival. In this unpaid work I have met with experts, emergency chiefs, childcare and health workers and politicians in all of the major parties. I have been a dual Canadian/Australian citizen for 12 years. I am not, and never have been, a member of any political party. In February of 2014 I was unexpectedly contacted by one of my many crime research contacts. He explained that he is currently stationed at Manus Island (something I had not been aware of), and that the information being made public about the violence that took place there was not correct. He explained that he was one of those who worked on the now deceased Mr Reza Barati, 23, trying to save his life. [Note: In the press the deceased has been referred to variously as Reza Barati and ‘Berati’, and age 23 or 24]. He confirmed that Mr Barati had suffered severe head injuries consistent with being beaten and ‘stomped on’. My contact, who wished to remain anonymous because they sign confidentiality agreements in order to work at the facility, gave me a full run down on the events, before the details became public: the ’20+ shots fired’ (not ‘a couple’ as previously claimed). The spent shells found within the compound. The evacuation of staff (but not asylum seekers) before the violence the ended Mr Barati’s life. The fact that people from outside came in and attacked and opened fire on the people there. The fact that it happened deep within the compound where people were trapped, far from the entry gate, and not ‘outside the perimeter’ as previously claimed by the Immigration Minister, who has since conceded that the information he initially provided to the public was incorrect. All of the info provided to me by my brave contact has proved true so far. Every last detail. And though my contact is stationed there, and can’t speak publicly, he wanted me to know that many of the staff there are excellent, highly-qualified expat Australians doing the best they can in bad conditions, but that Manus Island detention centre should be shut down as unsafe. I struggled with the ethics of coming forward with the information I had been given because I had to first be absolutely certain that the account could be fully corroborated, and because it is a highly sensitive topic, and clearly in the public, national interest. I came forward with the information I had in a public Facebook post on Monday around noon once I was able to fully verify all of the information I was given, something which took me several days, as a civilian. I felt a strong social responsibility to make the information I had public, and my source, who was not contactable for a time, (which caused me some considerable concern, it must be said) also made it clear that he wanted the truth to surface as a matter of conscience, and with the hope of change and ‘serious reform’. He came to me because he hoped that I could help, and he took some risk in doing so. I owed him for his bravery in coming to me, and trusting me to do something. The post was successful in disseminating the information my contact had entrusted me with sharing, and in truth became more of a focus than I initially anticipated. As more information has become available, and more sources have personally contacted me, I have decided to write this blog to collate it all in one place. Again, since this initial information was given to me, and some time after my initial post, the account provided by my source has been fully corroborated publicly by multiple whistleblowers, on tape, shown on the ABC and later, SBS. The first ABC account aired 7 hrs after my initial post. ‘We feel we cannot protect in this environment,’ he said. ‘Our empathy for them is palpable but we are not supported by policy. This place needs total reform or closing immediately,’ I was told. This account is consistent with the accounts of whistleblowers on the ABC 7:30 Report and the account of Liz Thompson, a migration agent who worked on the island and spoke to SBS. The deadly clashes on Manus Island allegedly flared after asylum seekers realised the Australian government had been ‘lying to them’ about plans to resettle them, and some asylum seekers decided to protest. ‘So what that means is… you’re never getting out of this camp, it’s indefinite detention,’ she told SBS’s Dateline program. This claim is consistent with my contact’s assertion that there was a ‘lack of action’ on behalf of the government regarding processing. I have been told that after some asylum seekers began to protest, expatriate G4S guards tried to help those who ‘did not want to participate’, but those guards were ultimately evacuated as things spiralled out of control when locals entered the compound with weapons. A G4S guard told the ABC that it was PNG guards who let the armed locals into the compound. My contact wished to stress that many of the expat G4S guards stationed there are highly trained professionals and have a good relationship with the ‘clients’ in their care. He described the majority of the clients as ‘genuine refugees’ and said that many displayed ‘exemplary behaviour’ throughout. My source claims that expatriate G4S guards in no way took part in the violence, but tried to calm the situation and help clients remain safe before they were forcibly evacuated. Without wishing to editorialise, I will say that his descriptions gave me a strong impression of how outnumbered some expat professionals were as they tried to stop the violence, and protect ‘clients’ in serious danger. I was also told of a client who had been ‘beaten up in the riots by G4S locals after being pulled out from under his bed’. He was described as being a diabetic who avoids physical confrontation due to the fact that it takes him weeks to heal. LIAM COCHRANE: Some of the asylum seekers who tried to escape the violence by hiding in a gym were dragged out…and brutally assaulted. WITNESS: When they went down, some guards ran – they came after they just kicked them again. The other guards come again. They all have their turn to fight them. LIAM COCHRANE: The expatriate guards reportedly stayed out of the violence for the most part, trying to calm the situation and overseeing operations. Azita Bokan, an interpreter working in the detention centre on Manus Island, spoke to the ABC’s Richard Glover, saying she witnessed seven G4S guards assault a detainee who was pushing an injured man in a wheelchair towards the medical compound. A contact at Manus Island informed me that he had found many spent shell casings inside one of the compounds, and they were not clustered. He provided an image (below) of one of the recovered casings. ‘Ejected rounds were not clustered as you would expect from multiple rounds being fired in the same direction but randomly scattered suggestive of indiscriminate shooting – certainly indicative of a weapon being fired in multiple directions,’ he told me. Above: An image provided to me allegedly showing one of numerous 5.56 mm shell casings recovered from inside the Manus Island Mike compound where shooting took place. Note the dent below the shoulder on the far right showing ‘classic M16/AR extractor damage’. Previously unseen images have also been provided to me, several of which I have included in this blog. The first floor accommodation stairway in the image at very the top of this blog (the stairwell shown on the left side) is the location at which the deceased, Mr Barati and two other clients were found, all unconscious. I have been told that all three were ‘transported from the site on riot shields’. Another identical stairway at the rear of each block reportedly allows for easy access/egress and is the route allegedly taken by locals to gain access to clients in rooms once they had ‘breached the rear fence’. I have also obtained independently verified testimony from Manus Island asylum seekers, recorded shortly after the unrest that left scores injured and left Mr Reza Barati dead. In the compelling testimony the asylum seekers, who cannot be named in this blog for reasons of safety, are explicitly asked by expat staff to explain their claim that PNG police opened fire on them in the Mike compound, rather than simply firing warning shots into the air as some had claimed. ‘Were the police shooting at people, or in the air?’ the men are asked. ‘No. Not in the air. Definitely’, comes the reply. ‘When they came in and shot the bullets, he was the first one, and everyone run,’ the man explains of the shot asylum seeker. The men on the tape repeatedly point out that there are multiple bullet holes in the walls of the compound, proving that the shots were not aimed in the air. 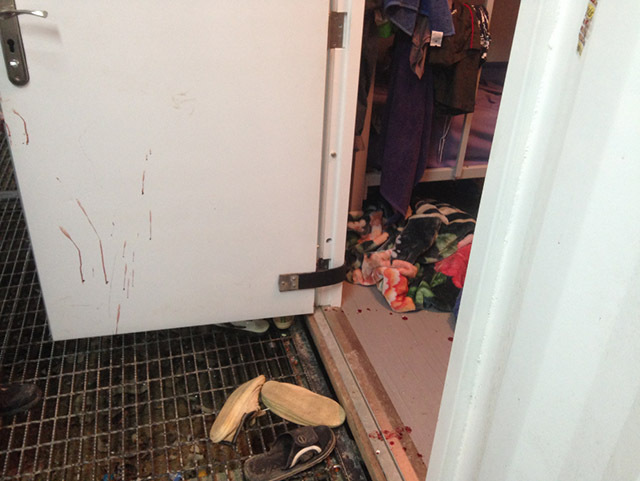 This is corroborated by clear images of bullet holes (and injuries) in a post by Asher Wolf: Photos of Injured Asylum Seekers at Manus Island Detention Centre. A video obtained by The Guardian also shows staff trying to help seriously wounded asylum seekers on the ground as one staff member shouts out the words ‘gunshot wound’ and a body is rushed through. 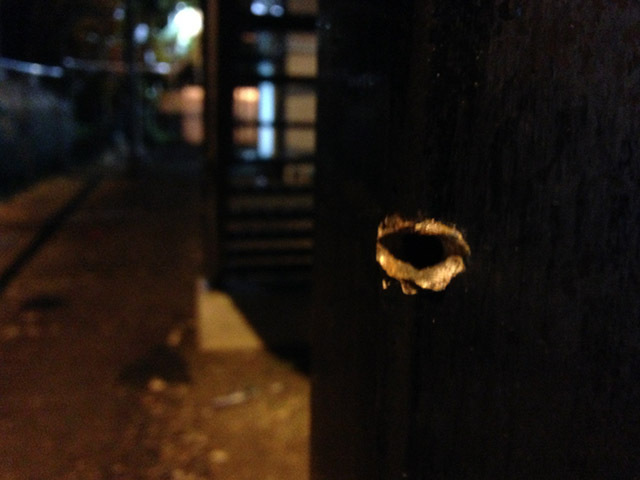 In addition, I have been sent an image, posted below, which allegedly shows bullet damage inside the compound. LIAM COCHRANE: An asylum seeker says he tried to hide in a room but was dragged outside to where G4S guards, police mobile squad officers, local residents and asylum seekers were clashing. He says he was stomped, kicked, punched and hit in the face with a heavy object. ASYLUM SEEKER ‘A’: Please, please, please don’t kill me, don’t kill me, don’t kill me. LIAM COCHRANE: The asylum seeker says a Papua New Guinean G4S guard intervened to get him away from the violence. That same night, nearby, 23-year-old Iranian Reza Berati was killed. This claim is backed up by images I have had access to, showing staff and asylum seekers trying to shield themselves using plastic chairs during the riots. A human rights inquiry in to the detention centre was underway but is now in doubt. PNG’s Minister for Foreign Affairs and Immigration, Rimbink Pato, reportedly told Fairfax Media that it was a ‘a joint effort’ and the government was moving on the basis that Justice David Cannings, a former human rights lawyer, was presiding over an inquiry he had himself initiated, and that the inquiry was calling experts without complying with ‘proper processes under PNG law’, The Age reported. Further updates will be found here and on my journalism page. It is not my job to speculate on the political implications of this information and I will not be doing interviews on this matter. I would like to thank everyone who has left kind messages of support after the Manus Island revelations. And to those who have written comments about how I ‘made up’ an ‘imaginary’ anonymous contact to ‘rile people up’ – perhaps consider for a moment the incredible coincidence that I would somehow just happen to have correct information about what happened that night, before it was made public by independent whistleblowers who fully corroborated the account, and before many of the details were acknowledged by the Immigration Minister himself. I have a solid imagination, but I am not clairvoyant. Finally, I would like to thank everyone who has been brave enough to come forward, and I would also like to thank all those who worked to try to prevent this violence and the unnecessary death of Mr Barati, who was in Australia’s care. In April 2016 PNG’s highest court found that the detention of asylum seekers and refugees there was illegal and in breach of the country’s constitution. “Both Papua New Guinea and Australia are in agreement that the centre is to be closed,” Papua New Guinea’s prime minister, Peter O’Neill said in a statement. ‘UN report to state Australia is in breach of international torture convention’, Report on UN and Manus, March 9, 2015. 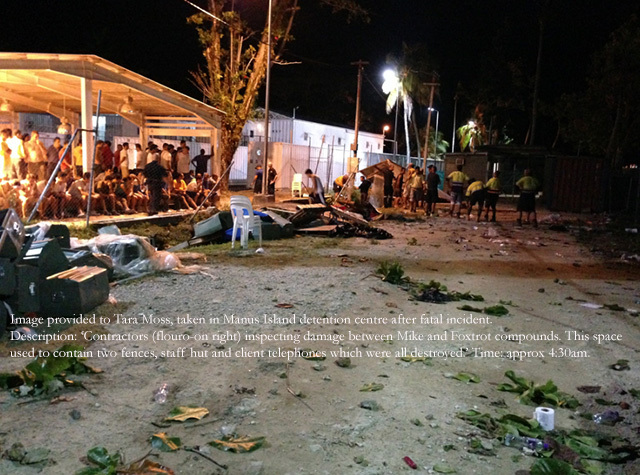 ‘The Manus Solution’ – Four Corner report, ABC, April 2014. ‘Kevin Rudd unveils ‘hard-line’ PNG solution for asylum-seekers’, July 2013, The Australian. ‘Chilling footage has emerged of “war zone”-like scenes during last week’s unrest at the Manus Island detention centre’, The Guardian. ‘UN condemns ‘Australia’s Guantanamo Bay”, ABC 7:30 Report. ‘Manus Island: How information is kept ‘under control’, SMH. ‘I was told to lie: Manus Island staffer’, SBS. ‘Asylum seeker safety on Manus Island’, The Wire. ‘We are in danger. Somebody please help us’, The Guardian. ‘PNG Supreme Court rules Australian detention of asylum seekers on Manus Island is illegal’, ABC April 2016. Leaked UNHCR report: Manus Island world’s worst, The Saturday Paper, Oct 2016. Thanks for making that information available, Tara. I admire the bravery of your contact. My experience with government and queries is that they are either ignored, steamrollered, or kept under wraps by intimidation. I asked a friend of mine to investigate information I was given about abuse of a schoolchild and, after he had asked the relevant department, he was called in and told to drop it. I regret I did not pursue it further, but she did not want to because she was too upset. Thank you, Tara Moss. This as has the ring of absolute truth about it and will be an important resource for future objective analysis. So chilling, the news that Imigration went ahead with that negative briefing despite advice to the contrary. Did AGWant thistonhappen. I fear they did. What will Robert Cornall make if your information, I wonder? Surely he cannot ignore. I hope you will seek to testify before him. He may decline, saying youwere not present. Please persist. Thanks for this Tara, not required to go up as a comment, just wanted to give thanks. Thankyou for your work to corroborate information and share this with us, it’s deeply appreciated. Thank you so much Tara Moss for speaking out about what you have been told about the murder and mayhem on Manus Island. She corroborates a lot of what you say and gives info on the Sunday night – ie she saw a severely wounded man in a wheelchair on Monday morning. Yes, I agree this has a ring of truth. So important that this type of information is published. Thank you all for your comments and support. I am going to shut down communications for a while and will check back tomorrow. As I run this blog manually, any comments will not be posted until I am back online. Sorry for an inconvenience that may cause. Thank you to your courageous contact. Thank you Tara Moss and of course a very brave friend of yours.As the saying goes the truth has and always will surface sooner or later as to what really happened at Manus Island. I would love the organizers of rallies to be held all over Australia to read the information you have provided, along with Liz Thompson and other reliable sources. Thank you for bringing some unbiased and unemotional facts to the public. You are a great Australian. Thank you, Marg. I have added the Richard Glover interview with Azita Bokan. Thank you all for your kind comments. I greatly appreciate it. Thanks Tara for doing this. How do we stop it? As a child refugee from Hitler, I grew up wondering why nations could act so amorally. It is no excuse that we are preventing some drownings if we ruin the lives of thousands instead! By demonising ‘illegals’, so they are not seen as people like us, both major parties have reduced the capacity of too many voters to see Manus and much of the rest of the program as inhumane and wrong! Thank you. I feel so ashamed and helpless. Well done Tara. Unfortunately Manus Is will go down as an infamous episode in Australia’s history. The assylum seekers arrive in and depart from Indonesia. Indonesia serves as a halfway house. Instead of pursuing boat people the government should be addressing the issue with Indonesia to ensure proper processing with appropriate and adequate paper work. We are just trying to close the gate after the horse has bolted. In my view it is a major diplomatic blunder that this has not been addressed and I fear confrontation is avoided for fear of repercussions in losing trade. Indonesia has a responsibility to respect Australia’s sovereignty and must be laughing in our face at the destabilisation this is causing in Australia domestically. I always thought you were far more than a pretty face, now I know you have the courage of your convictions. Thank you for publishing this report from Manus Island – ‘cos I’m not gonna hold my breath waiting for any truth from Scott Morrison and the rest of the Abbott government – well, maybe the exception Sharman Stone (watch how her career fares now). Thank you Tara for your bravery in putting this out. And thank you to your contact for being so brave in telling you what he/she witnessed. It is absolutely disgusting what is being done ‘in our name’. I really hope that your reporting even changes one person’s hard line opinion. I have been in debate with a former child evacuee from Britain who now pretends to be an expert on all things to do with children. She posted a letter in the AGE claiming if unaccompanied parents are trafficked by Australia to the island hell holes in contravention of their rights it is the evil parents fault for sending them here. Instead of engaging she accuses me of bigotry and child abuse – she should not be considered an expert at all. Her first rant about unaccompanied kids in prison was an 8 year old found in Woomera – she believed his parents were at fault, not Australia for jailing the boy once he got here. We even tried to deport him to Nauru to be with his uncle. Apparently it was OK for her to be sent away from war but it is not OK for Afghan kids to be sent away from war, they should stay and die or their parents are evil. Bill what are you on about? Indonesia will not protect refugees so they are allowed to leave, it is nothing to do with our pathetic sovereignty, sovereignty does not over ride human rights. Bravo, Tara. This is a crime that must not go unpunished. I am confident, or at least stupidly hopeful, that as more and more evidence comes out, more and more decent people of all political persuasions will demand answers – and change. We owe Reza at least that much. Tara, thank you so much for your report. The murder of Reza Barati is one of the most shameful things that has occurred in the sorry recent history of our treatment of asylum seekers. From what we read about Reza, he would have been an ornament to this country; we have lost a wonderful opportunity in this young man and the thousands we choose to torment rather than help. Thank you so much for this information. I have been hearing unconfirmed reports overnight that the “critically injured” detainee who was evacuated to Australia has now died. I wonder if you have heard anything on this matter? 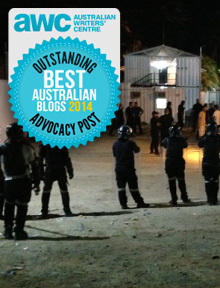 Thank you for giving voice to truth of what is happening on Manus. Good on you for adding your voice to this issue, Tara, and for obviously being rigorous in your fact-checking. Something as important as this demands that the truth not go missing. Thank you for the work you are doing to keep Australian’s informed of what is being carried out in our name. It is a sad indictment of this Government that we need to have private people, with public blogs keeping us informed of the truth. If we knew how to help, I am sure most Australians would be willing to, to allow desperate people the right to asylum on our shores. Thanks for making this public. If we were relying on the mainstream press for information about these atrocities, a lot of this would not come to light. I am a supporter of the ASRC and they are also posting a lot of information before it hits the press. I know many people, including myself, who are physically sickened by this government’s treatment of asylum seekers. On the other hand, many Australians agree with it. Abbott has whipped up xenophobia and racism. Thank you Tara. I wonder how history will judge us, what questions my grand children will ask me, what I will say when they ask me what happened on Manus Island in 2014. The current state of politics in this country is at all time low, and I am failing to see the EXIT sign. Thank you to your contact and the courageous job he has done for the people on Manus Island and keeping us all informed. I am still getting media tell me that Rudd caused this by changing some visa in 2008, not one of them ever mention the 9 new wars that caused 7 million people to flee their countries last year alone or the fact that it is quite legal to come here. Nope, it’s all down to Rudd changing the conditions of one visa in 2008. What’s worse is that they are so certain they are right. It was in fact Julia Gillard who didn’t like the high court ruling on the illegal Malaysia human trafficking deal and got Roxon to find ways to by pass it but cutting out all human and legal rights and leaving the only criteria to be if the minister of the day decides he should be allowed to dump refugees anywhere he can. That new law will be in the High court this year and will again be found to be illegal because we have to guarantee human rights and legal protections and know that we can’t. The thing is that Rudd’s dirty deal is not law, it has never been put to parliament, it’s a pity though that Marles thinks it is all marvellous and hunky dory. Sounds like wikileaks to me. Another wonderful person doing her best to undermine the Governments work in protecting our borders from a soft invasion. I have no problems with anyone coming to my country, using the legal means. If they can’t or won’t do that, they should not be coming and they certainly should not be getting any Australian legal representation in the process. Thank you Tara for your efforts to find the truth. The Australian Government has taken us down a dark road with it’s disgusting politically motivated treatment of asylum seekers. I hope Abbott and his henchmen get recorded in history for their inhumanity. Hi, so glad to see you are reporting these details and helping to get the story out. Keep up the good work. Re. children off the mainland in detention, I know personally of a 17yo female unaccompanied who is at Christmas Island. Can someone contact me at my private email re. same? I would like to somehow put this young lady in touch with some one who can help process her safely to somewhere here on the mainland and get her off CI. Thank you. Thank You for trying to let the people of Australia know the truth. We have not been allowed to hear the truth about asylum seekers for far too long. I know if I was in this situation I would want the reasons why I left my country to be known. It seems unbelievable that Australians are being pushed to think we will be over run by these ‘boat people’, when we take so very few refugees compared to countries in Europe and that the majority of illegal entrants to Australia come by plane with legal documents. Thank you all for your feedback and support. I will be signing off for a while, and as I operate this blog manually, there will be some delay in posting any new comments. Sorry for any inconvenience that may cause. Seeking asylum is not illegal. There is nothing illegal about what these people have done or are attempting to do. And before you scream ‘economic migrant’, on average around 90% of asylum seekers arriving by boat are found to be genuine refugees. ie. They have a legitimate claim to seek protection. Wedgie, there is no illegal way to come to Australia. Having past experience of The Commonwealth Migrant Hostels and The Good Neighbour Council, I am appalled at what Australian politics and thus some of us have become. ‘Then you will know the truth, and the truth will set you free’ John 8:32. Time to go back to first principles and offer the protection that is sought as so far 98% of asylum seekers when processed are found to be genuine refugees. Tara thank you for sharing. When it was first announced that Manus Island would be the next place for asylum seekers, I had a heavy heart feeling that this was not the right place for these people. I now know why. Such tragedy and violence which did not need to happen. Andrew, Marilyn and Jane thank you for showing Mr Wedgie how ignorant he sounds. It is very obvious he has never lived in a land of persecution and war. Your comments are absolutely correct. He needs to do a little reading or maybe we should send him to Manus. Bet he has never met an asylum seeker or refugee. I am sure the tune would change! Keep the knowledge coming for my fellow Australians who think the same as him. I can only echo what so many others have said earlier. Thank you for sharing your very brave friends information. And with such compassion and beautifully written. Tara, thank you for bringing this information to the public’s attention. This is so vital to expose our Government’s horrendous disregard for the human rights of those who seek asylum – I sincerely hope that one day Scott Morrison, Tony Abbott and all who have allowed this situation to occur will face justice for their inhumane policies. Whenever it seems the decisions made by trusted and powerful adults are too horrific for my mind to reconcile, I try to find a Dr Seuss quote to share. He had the most amazing way of educating adults while they thought they were just reading stories to children. Thank you Tara for saying what so many of us feel. Thank you, Tara. Finding reliable, truthful information on this issue from overseas hasn’t been easy. I love the Dr Seuss quote. We can’t sit back and allow this human rights violation to continue. Informing the public is the way forward, and all I can do right now is share that information, and pray for more compassion and wisdom in our governments. Meaning of word “fight” as written above and heard on radio. The speaker is using good English, but will be influenced by the Pidgin language which is universal in the New Guinea part of the country. In Pidgin, the word ‘pait’ does come from the English ‘fight’, but it means ‘hit’ (‘fight’ is a rather abstract word which would not make sense in Pidgin). Thus the speaker quoted would be meaning Hit. To print the word ‘fight’ is to suggest that the victims were engaged in fighting so that their injuries might have been their own fault. If we understand ‘hit’, the meaning of the story is much more clear cut. This is of course a problem in all reporting: the naive reporter thinks that the local informant is speaking the same English as the highly educated reporter. The fact that IHMS provided this guide to staff, along with the information it contains is excellent corroborative evidence that both staff and asylum seekers were convinced it was PNG locals who attacked the compound. Just came across this tonight…surprising to also read one, possibly two people have lost their eye sight after being attacked in this riot. Not only did one lose his sight, the government sent him back to Manus for a while for a few weeks until he could be returned to Brisbane to get his eye removed for good. Geez. We saw you at the March in March in Katoomba…. love a woman with beauty and brains!! Not really a comment but an invitation to the event on the front page of the Blue Mountains Refuge Support Group…. Thank you for making this report available. I have just watched ABC’s report on Manus Island. I feel heartbroken that we are treating innocent people with such violence and disrespect. Can the Human Rights Commission not put pressure on the government to close this terrible facility? The people incarcerated there must be terrified. I have read some of the articles, from most of the Sites! i worked on Manus for G4S. Most accounts are very accurate! however a couple of the Whistle Blowers whom i worked with, were SAS Officers, both good people i feel, however Martin! mate, you were never a Instructor of SAS and IRT!!! sorry mate that is the truth. The majority of clients were decent blokes, and some under differing circumstances would have been very good friends, others however should never be allowed to reach the shores of Australia. DIAG had all hands tied, regarding decision making, G4S and all other support elements merely danced to what ever DIAG commanded! !, Transfield and Wilson’s will toe the line too!! or face the loss of contract, just like G4S. I must praise IHMS, SALVOS, all other support elements, fantastic people who did there very best, under the most trying conditions. G4S X-Pats you did your bests, God Bless. Good Luck Wilsons, you will need it. To the clients, sorry we could not do more. Thanks for this Tara. As the ex Research Officer for the Deaths in Custody Watch Committee, retired army officer and a person born in a Nazi camp, it is a subject close to my heart. For some years I have proposed to politicians the need for a federal Inspectorate of Custodial Services (http://www.oics.was.gov.au) to no avail. This might take some of the politics out from the discourse? That the DICWC facilitated this office in WA I consider a small victory. It’s great to see what is actually happening here, not just what is shown in mainstream media. Keep up the good work!